We've got a letter for you! 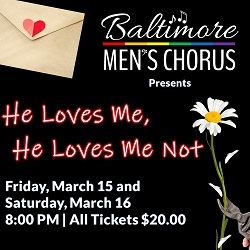 Join the Baltimore Men's Chorus for a cabaret evening of songs all about falling in (and out) of love! Singers from your favorite chorus performs your favorite love songs and breakup ballads from stage, screen, and the top of the charts. We think you'll love it!